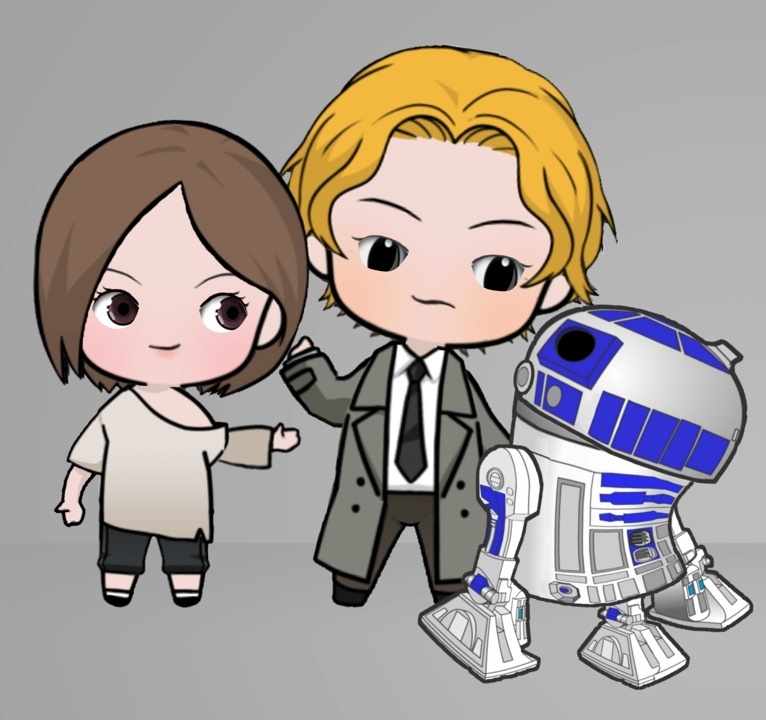 I love a really good avatar creation app because it feeds my narcissism (I mean somebody has to take an interest me, right?). 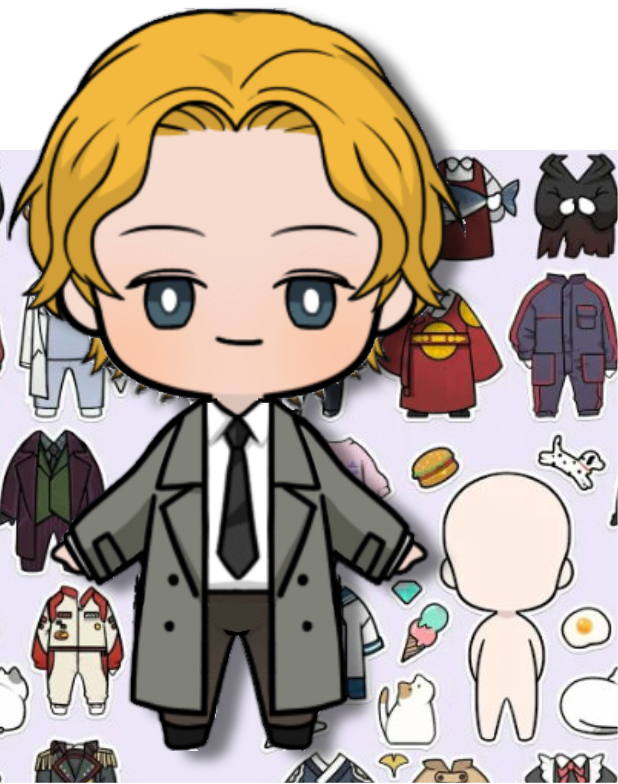 So when I came across Oppa Doll for Android, a super cute Chibi avatar creation app I immediately went to work on creating my TET Avatar as a chibi character. The creators of the app are not wrong when they say your character "will be the most adorable character in the world." 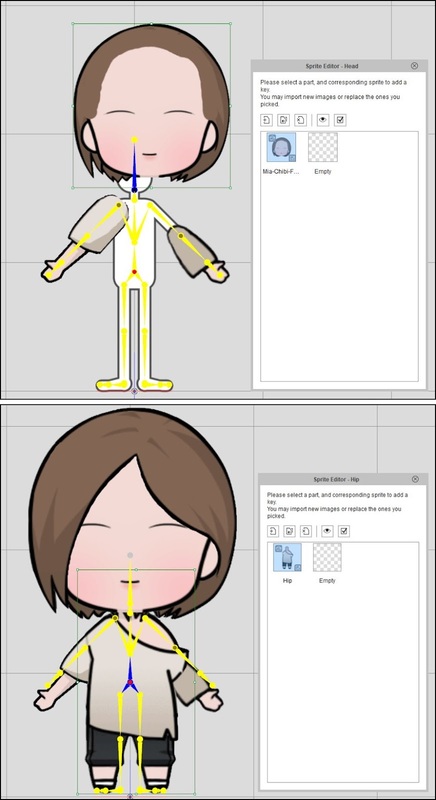 I was so impressed by the quality of my finished character I was inspired to see how quickly I could turn it into an animated character using Reallusion's CrazyTalk Animator 3. The fastest way to create a character in CTA3 is to put a Morph-based head onto a G3 character body rig (don't worry if you're not familiar with those terms they'll be defined as I go). For this article I decided to make a companion character to my TET Avatar, called Mia. That's Mia on the left! 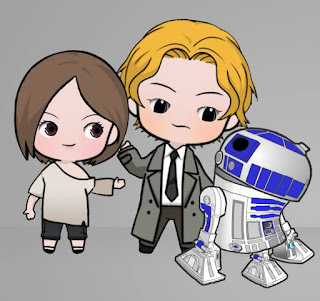 Mia often appears in animations and comics with my TET avatar, along with a replica, fully sentient Star Wars droid of R2D2 (because I just thought it was a funny team up). The three characters are basically my homegrown version of Doctor Who. They travel through time and space, having adventures along the way. Mia is one of my only recurring characters that I've never personally drawn my own version of. She's always been created using third party avatar building applications. Top: The four Avatars I created with OppaDoll. it separates into six layers. One that showed her with arms (because the outfit I wanted had her arms behind her back). A version that gave me something to base the back of her head on. A 'naked' version so I could get an image of the head with no eyes. I used these characters to create a composite Photoshop file with six layers; Front Hair, Back Hair, Face, Body, Right Arm, Left Arm. Note that I could've just taken Mia's final character avatar directly into CTA but these extra steps were so she could have independent movable arms and better looking eyes. As there were only six graphical elements, I decided it would be quicker to use the character sprite replacement method rather than put everything into a G3 PSD template. bone adjustments have been made. To do this you simply place the appropriate G3 Human Dummy Character onto the CTA Stage, open the character in the Character Composer, select a bone you want to add/change a sprite on, then open up the sprite replacement tool to import your graphic of each body part. Placement and size doesn't really matter at this point. All you want to do is make sure your images are attached to the appropriate bones. Note that you don't need to import the head sprites at this stage, other than the face sprite for reference. The face sprite will be deleted when you create your morph based head. Once you have all your images imported, keep the sprite replacement tool open and work on getting all the parts in the right position in relation to each other. Don't worry if the bones don't line up but try to position your character's feet at the same level and position as the dummy character. using the Bone Editor tool. 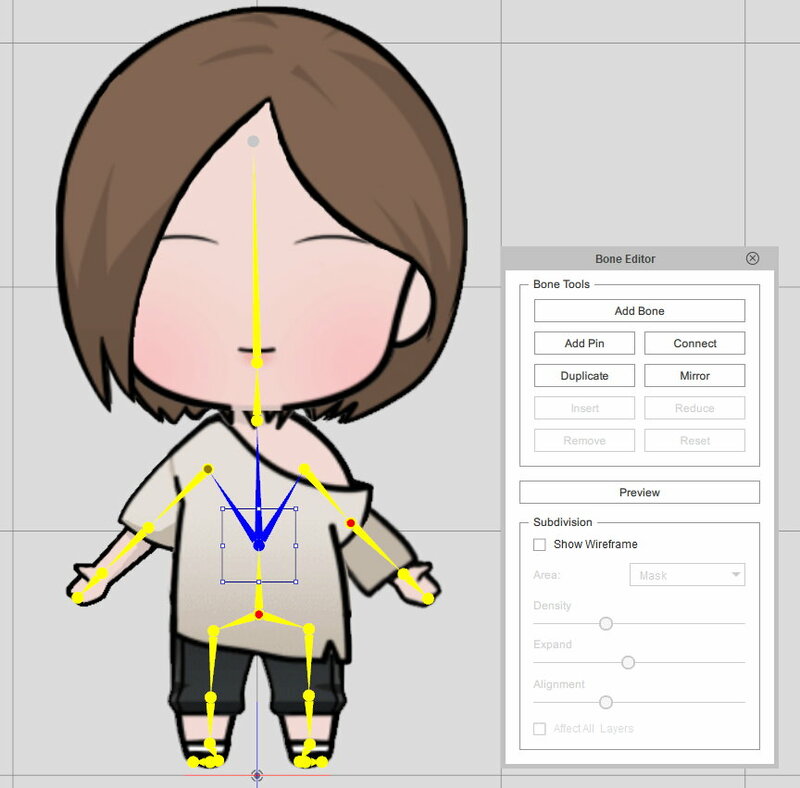 Use the Bone Editor tool to drag all the bones in place to match your character's proportions. Hold down the Shift key to move a bone without affecting the child bones attached to it. You generally want to aim for all the bones being yellow in color when you're done, indicating that they are correctly placed over your sprites. Again, don't worry too much about the face bones. Focus on getting the body set up. Start the process of making your head by clicking on the head bone and then selecting 'Create Morph-based Head' from the head creation menu. You may be asked if you want to save the settings of your current head (say no) and if you want to replace the current head (say yes). You'll then be prompted to import your main face sprite and then CTA3 will step you through the morph-based head creation tool. Most of the process is pretty self explanatory. I've created a numbered graphic of the process on the right (click on the graphic to see the full size version. Just roughly place the eye points here. You can fine tune their placement in steps 3 and 4. The reason I didn't include eyes drawn onto my face is because I'm going to add CTA3 cartoon eyes which will add all the features of the eyes from makeup to eyelashes etc. Don't miss placing the detail points by clicking the detail point icon. If you just click the 'Next' button after placing the basic points you'll skip straight to Orientation step 5. Because this is a 2D character the face depth should be set to the lowest number. However you can experiment with this. You may like having more facial depth (All these face fitting settings can be changed later). Once you've been through the face fitting process you may need to resize your head and position it correctly on your character body. Check that your head is first in the Layer Manager too. Once everything is in place position the facial bones. Particularly focus on the Front and Back Hair bones and the nose bone being in the correct position for your character's face. At this point you can also add your front and back hair sprites using the same sprite replacement technique on the face bones i.e. select the back hair bone, open the sprite editor and import your back hair sprite. At this point we're pretty much in the home stretch. Adding eyes is as simple as selecting eyes that suit your character from the Morph Eyes folder of the Content Manager (On the Head Tab). I used a set from the Anime folder. If the eyes don't look quite right you can make all kinds of adjustments to them in the eye editor. For my character all I did was scale them so the iris would fill most of the eye area. Adding teeth is the same as adding eyes only this time you're selecting from the Morph Mouth folder. Down the bottom of this selection are a bunch of comic style teeth. I selected one that didn't detail each individual tooth. Again the teeth and mouth interior can be edited with the Mouth editor. For my character I made the teeth a little larger, lowered the Y position a small amount and turned the brightness down a touch, so they wouldn't be such a bright white. See how everything is working using the Face Calibration tool. If your character's body isn't bending very well you may want to adjust the wire mesh that determines how the images bend and flex. Open the bone editor and turn on 'Show Wireframe'. Make sure the 'affect all areas' box down at the very bottom is ticked, then adjust the three sliders. Generally the area you need to affect is only the Mask not the full image. Density will give you a finer wireframe; Expansion is how far outside the image area the wireframe should extend; Alignment adjusts how the wireframe's divisions. Once it all looks good save your character to the custom character folder of the Content Manager - just select where you want to save it and hit the plus (+) button at the bottom of the window. Return to the stage where your finished character is ready to animate. If your character's back hair is like mine and extends past and in front of the neck, use the layer manager to send it to the back, behind the body before you start animating. Now that you've seen how easy it is to set up a single angle character with a morph based head you could use this technique to animate a whole cast of avatars from any avatar creator. Morph based heads do not have to be front facing. It's possible to make them at the 315 degree angle - which is typically the side angle used for most side facing characters and side facing predefined motions. 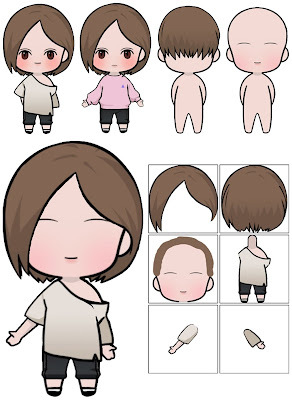 If your avatar creator is capable of multiple angles, you have that option to make both side and front facing versions. To make these characters even more versatile you could develop multiple hand sprites for them as well. TET and Mia, looped dance.